Beginning in Temps Plus version 4.0.147, you can now opt to email excel spreadsheets of active placements on a given job or jobs to employees and/or customers for the purpose of entering time. When the files are returned, a Temps Plus Timecard Processor program can validate and create entries from these spreadsheets directly into the current payroll activity of Temps Plus. In Customer Maintenance, a new dropdown is available which you can assign email time cards spreadsheet layout to a given customer. 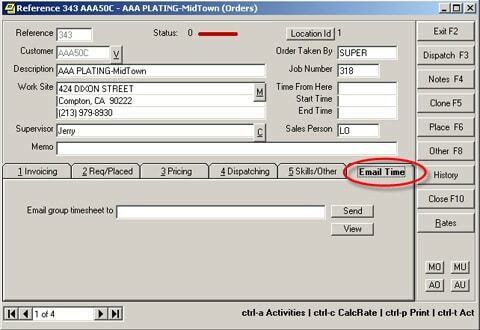 In Job Order Maintenance”, a new tab, “Email Time” is available to designate a mailing address for email time cards spreadsheets (when all time entry for a given job or jobs is to be handled by the same person.) There are also 2 command buttons in this tab to Send an email time cards spreadsheet interactively and to View a summary of email time cards files previously issued. In Employee Maintenance”, a new checkbox, “E-Time” is available to designate that email time cards should be mailed to the email address for the employee for all active placements for the employee which were not being mailed to an address specified on a job order. A new entry appears under the Enter >> menu, “Email Time Cards Spreadsheets”, which launches the Timecard Processor program, which captures the information from returned spreadsheets. 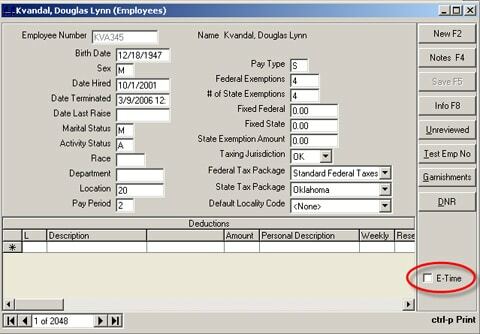 Process>>Payroll>> Menu, “Email Timecard Spreadsheets” for sending timecard spreadsheets in batch. You are presented with a dialog box requesting the work date/period end date. This must be coordinated with the starting and ending dates on job orders and placements. Only orders and placements that start before and end after (or with no ending date) the requested work/period end date will be considered when creating spreadsheets. You group columns to be used in a given style of spreadsheet using the Layouts grid which is presented immediately underneath the column definition grid. If your needs are the same regardless of customer, then you will only need the default layout. You don’t need to have different columns defined for overtime versus regular time although you certainly can do it that way. You could simply have a column called Hours and Temps Plus will automatically do the splitting between Regular and OT when appropriate. You assign spreadsheet layouts at the customer level, in the Customer Maintenance routine. Initially all customers are assigned the default layout. Spreadsheets are always for a given work date or period end date. The system keeps track of the spreadsheets sent and received and validates the legitimacy of the basic data when processing spreadsheets for entry into Temps Plus. When spreadsheets are sent by pressing the “Send” button on a job order form, only a single spreadsheet is sent for the single order and it uses the style assigned to the customer the order is for. The work date is prompted for, and if this work date had not been previously issued, the spreadsheet is built, the email prepared and then the user is presented with the email for any customization of the email content. If the work date had been previously issued, the user can opt to send a supplemental spreadsheet for new placement activity or the user can opt to void any and all previous timecard spreadsheets sent for that job on that work date and issue a new spreadsheet based on current placement data. When timecards are sent in batch through the Process>>Email Timecard Spreadsheets option, the user is first prompted for a work date and then, if the user can access all locations, they are prompted for the Location Ids to issue for. Supplementals and Voids are handled as previously mentioned with the exception that the system differentiates between what was sent via pressing the “Send” button on an order versus what was done in batch. So you could send a job a spreadsheet early without interfering with sending via batch, for the same work date, later on. In batch, each location is handled separately. 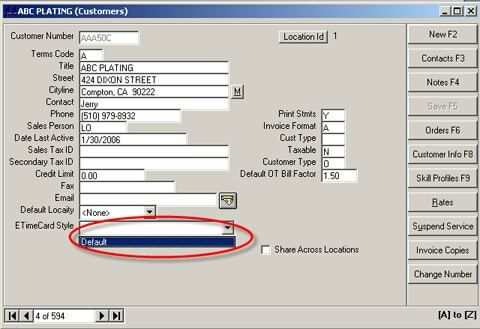 Within location, the grouping of the spreadsheets is based on the destination email address and the Layout of the spreadsheet. For example, if you had an email address of [email protected] as the email address for 10 different jobs at 10 different customers and all those customers used the same Layout, then a single spreadsheet would be built for those 10 jobs and it would be sent to [email protected] If 1 of those 10 customers used a different Layout, then [email protected] would receive 2 spreadsheets: 1 for the 9 jobs in the same style and 1 for the job in the different style. Similarly, if an employee set to receive timecard spreadsheets worked on 10 different jobs over the course of the day/week and the email timecard address on those job orders was blank, and all the customers used the same Layout, the employee would receive a single timecard spreadsheet that contained rows for timecard entry for each of the jobs. If the customers had different Layouts, the employee would receive spreadsheets grouped by Layout. When spreadsheets are generated a Crystal Report is used with an export option of Excel. The column headings are handled via formulas in the report so a single report format can handle multiple Layouts by simply setting the formulas according to the specified layout. The Crystal Report used, in most cases, is a file in the Npath named “ETimecard.rpt.” If all the timecards within a group being emailed are for the same customer, the system will look for a custom timecard report file in the npath named “ETimecardCUSTNO.rpt” where CUSTNO is the customer number. You can customize the spreadsheet reports to change the basic appearance, add or remove information, etc, but take care. Creating good layouts for export to Excel can by tricky. When in doubt, work with Bridgeware to develop custom layouts. Always test a modified timecard report for use with the Timecard Processor in a test company code. Issue spreadsheets, enter some time into them and then process them to insure they are properly aligned. When completed spreadsheets are returned, the time and expense data is brought into Temps Plus by using the Timecard Processor program, TPTime.exe. You can access this through the Temps Plus “Enter>>Timecard Spreadsheets” menu item. The program allows you to view spreadsheets prior to processing and to view a report of the entries created from a spreadsheet after you process a file. Once processed, the file is renamed from an XLS file extension to a TPT (Temps Plus Time) file extension to let you know the file was processed and to filter it out of browsing for any remaining unprocessed spreadsheets. You may import or view the timecard spreadsheets by entering the path and filename of the spreadsheet you wish to import or view. “,DNR” can be added to any of the above to designate a “Do Not Return” to the customer. If “DNR” is used in the Action column without specifying a close status, the current placement will be closed with a status 3 and the DNR will be set. Case is ignored when evaluating the Action column. The “Offset” column adds support for day by day hours entry. Column definitionscarry an offset days value of from 0 to 6 to tell the system how many days to subtract from the period end date for values entered in the column.